Clean Rooms International’s suspension hardware for 2” Heavy Duty T-Grid Systems is designed and manufactured to meet the exacting standards of the cleanroom industry. Gasket and Gel Seal Style suspension hardware is interchangeable and includes a series of intersection connectors and turnbuckles for suspending the T-Grid System from the building structure. 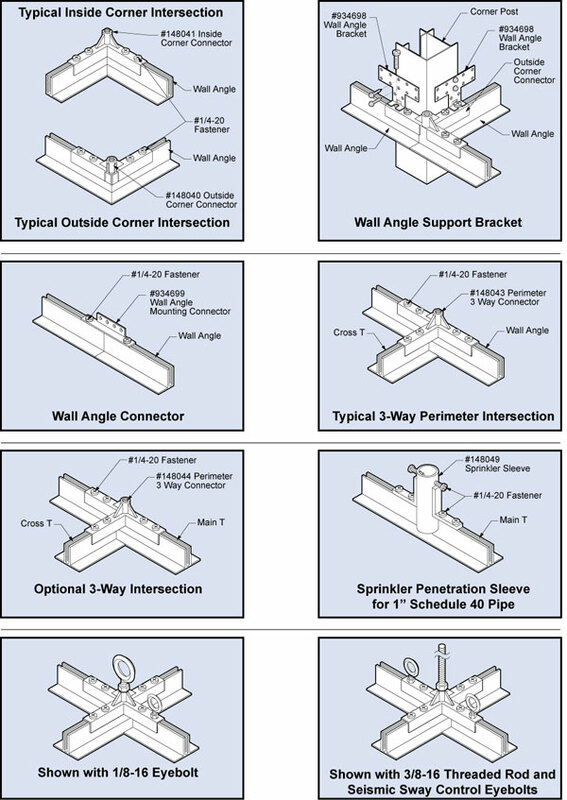 Connectors are designed to accommodate standard 2’ x 4’ openings and other unusual configurations. The zinc castings are designed with an integral 3/8” x 3/4” high threaded tower providing a strong load bearing capability. The tower accepts our 3/8” #148038 Right Hand/Left Hand 8” stud which is connected to a #148039 threaded turnbuckle. A preferred method of suspension from the building structure is all-thread rod attached to the turnbuckles as illustrated. Sprinkler Penetration Sleeves, Ionization Emitters and seismic sway control can be incorporated into the system. For applications in seismic zones, the all-thread rod serves as a compression strut and splay wires can be attached to eye bolts secured to the Intersection Connectors. Local seismic codes vary. We recommend consulting with local authorities for clarification. 0.40 1 per 16 sq. ft.
1 per 16 sq. ft.